in the Bluefish run the sort function of a GtkTreeModelSort is called after the GtkTreeModelSort should have been finalized and free’ed. First I used gobject-list.c from http://people.gnome.org/~mortenw/gobject-list.c to see all refs and unrefs on all GtkTreeModelSort objects in Bluefish (luckily there is only 1 used in Bluefish).This showed that there was indeed a GtkTreeModelSort with lots of references left after it should have been finalized. I tried the same thing on Fedora 16 (also gtk-3.2), but it can only be reproduced on Ubuntu 11.10.I tried to get backtraces with gobject-list (which uses libunwind for that) but those backtraces turned out to be useless. I configured gdb to log everrything to a file, and did a bluefish run. This resulted in a 2.1 Mb logfile with backtraces. This log also showed there were more refs than unrefs. After this step I had only 15 backtraces left. And from these backtraces the leaking references were easily identified. Now I am wondering if this approach would work for any reference count leaking problem. I guess the most difficult issue is to find the value of the pointer that is leaking if you have many objects of the same type.. Any suggestions how to do this? 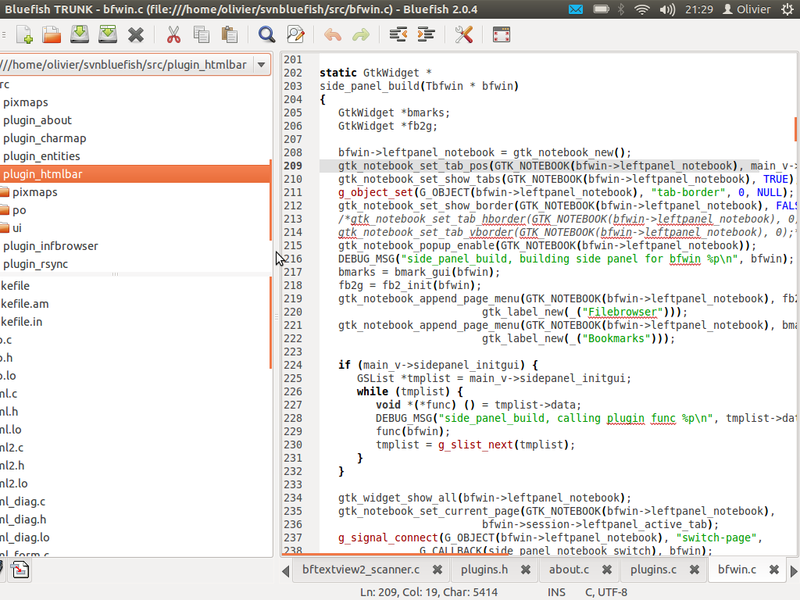 Bluefish, Ubuntu or Gtk bug? There is a weird widget scaling issue happening with Bluefish compiled on Ubuntu 11.10 with gtk-3.2.0 that I don’t see on the same Ubuntu 11.10 with Bluefish compiled with gtk-2.24.6 nor on Fedora 15 compiled with Bluefish compiled with either gtk-3.0.12 or gtk-2.24.4. In this example there is a long string in the active entry of the GtkComboBox, but if there is a short string active and a long string only in the popup menu, the issue still appears. 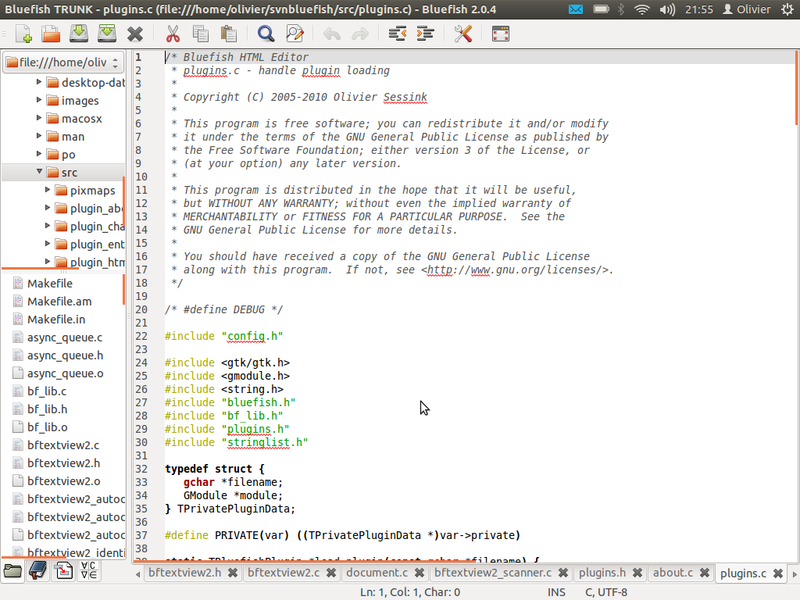 So the minimum width is defined by the longest string in the GtkListModel. In the documentation I cannot find if a GtkComboBox should shrink smaller than the text that is possibly in the popup menu. But I do know that this has never been a problem before on any gtk version up to gtk-3.0 (but Fedora 16 is not yet released, so my only Gtk-3.2 box has Ubuntu 11.10), so I’m wondering if the bug is in Bluefish, Ubuntu or Gtk? Update 2: thanks to the comment from Benjamin Otte I fixed part of the issue by setting the ellipsize property to the GtkComboBox text renderer. However it is still not really back to normal nice behavior. The GtkComboBox furthermore has weird/buggy behavior if ellipsize is disabled. If there used to be a long string in the model, but that string is gone, it still wants a very big width. I think at least this bit is buggy.